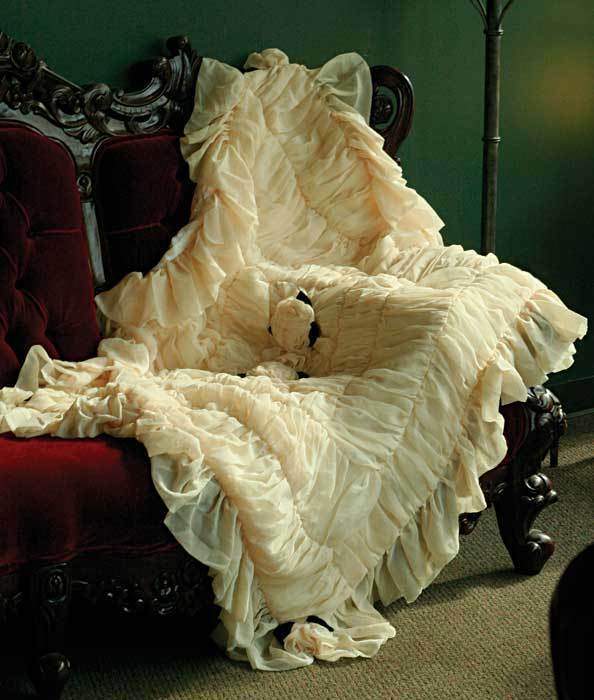 Chiffon Throw from Victorian Trading Co.
Shirring is just a way of gathering fabric. The above picture is a blanket that looks "shirred." It is probably made from gathered pieces which are then sewn to other gathered pieces, with a ruffle on the edge and a backing. The regular cost of the chiffon throw, which is a small blanket or lap quilt, is $250. You can probably see why it is so expensive, since it takes quite a lot special fabric, plus precision and time to cut out all the pieces, gather them, join them together, and add them to a backing. I had been looking at this photograph quite a while to figure out how it was made, so that I might have one myself, without paying such a high price. I also wanted to see if I could figure out a way to make it in fewer steps, by just gathering a piece of fabric, instead of attaching gathered pieces to a square. Of course, if you have the money and prefer to buy this quilt, that's just wonderful, because it is a lot less trouble than sewing one. This one is for those who have some sewing machine experience and understand the process of shirring, or gathering. This project took me about 2 hours to complete, and I made it just by hand-gathering lines all around the fabric--no cutting or piecing or pulling up gathering stitches. Read on, below to find out more about this shirred blanket! I chose light weight, thin polar fleece (the thinner the better, which is usually the cheaper kind), but you can use any fabric, including silk, satin, cotton, or white muslin. The project took 2 yards of 50 or 60 inch fleece, but when all the shirring is done, it is reduced to slightly over one yard. You'll need to know that if you decide to make it into a bedspread for any size bed. The first thing I did to plan this project was to draw the pieces that I thought had been used for the original chiffon throw in the picture. It looked like there was a square or rectangle in the middle, and I counted 3 outer rows of fabric, plus a final row of ruffle. The difference between my project and the Victorian Trading Co. blanket, is that mine required absolutely no cutting or piecing together. This is a one-piece project. I only gathered the fabric as I stitched it, putting the gathers gently through the sewing machine feed by gathering on either side of the needle with my hands. I drew these same lines, spacing them evenly apart, (using a large, flat sewing ruler on a cutting board) and also leaving a few inches for the ruffle. Throughout this project, I did not cut any fabric at all. Everything you see here is gathered right on the fabric, even the ruffled edging. Above, you see how the fabric is fed through the needle by grasping both sides of it and hand gathering. You don't have to be to precise with this, because it is supposed to look very rumpled and puffy. You do have to be careful not to make the gathers too flat, or it won't turn out well. Just gather up the fabric into small pleats and feed it through the needle til you get to the corner of the pencil drawn square. This is what the middle square looked like, at first. As the other squares are gathered and sewn around the middle one, it starts to look more like the chiffon throw. This is what it looks like when another square has been gathered and sewn around the center square. So far, it does not look very square-ish, but you'll see as I get further toward the edge of the fabric, that it looks better. After each square is sewn around, back stitch, lift off the needle, clip thread, and move the fabric over to the next pencil line and start feeding pleats and gathers through the needle, beginning in a corner. The last square at the outer edge will be the one that creates the ruffle. You can see the ruffled edge in this photo taken outside. This whole quilt was only done by pushing gathers through the feed mechanism and sewing them. Because this is fleece, no hemming is needed, but if you make it with muslin or any woven, you will only have to hem the two cut ends, as the two other sides will be already finished by the selvages. I wondered how to add the roses that I saw in the original photograph. When I had finished stitching all the gathered squares, I noticed places where excess fabric drooped and sagged a lot: the corners and the middle square. So, I pulled up sections in the corners and wrapped thread around each one, to make puffy roses from the sections of the blanket that were more bulky. You could use a threaded needle to do this, making several stitches through the "stem" area and tying the thread in a knot. Shape the roses by fashioning them with your fingers to look like petals. This is what the blanket looks like draped over a little table. You can see the rows of stitches going around the center. I hope to add pictures of the backing, when it is completed.The backing is more fleece, but with a pile, sort of like fur. I really am excited about this blanket because it is warm, and because it could be made in so many different colors and fabrics. I hope I can sleep tonight, since my mind will be whirring with ideas of another one in a bright color. This is not a gathered project in the sense that the threads are gathered up. No thread here is gathered or pulled. The gathers or pleats of fabric are sewn down as they are fed through the machine needle. Be sure to back- stitch at the at the corners, and if you like, you can reinforce the rows of stitching by sewing them again when you add the backing. One advantage of this hand-made blanket is that it has no satin on the back, as does the original. Satin tends to slip off a couch or bed, but the fleece one will stay put. This is the backing made of a thin white muslin with a silky sheen, attached by taking small overlapping stitches here and there to secure the top and keep it from being so loose and floppy. I wish you could see this "for real" because it is so soft and looks like white icing on a wedding cake. The total cost was probably about $8.00, and I bought the 2 yards of thin fleece (a synthetic) at WalMart fabric department but it should be available in any fabric store. Anyone is welcome to use this idea for making things to sell. A pillow or a curtain could also be made from this technique. Very clever, I can imagine how soft it would be. It isn't something I would ever attempt as I'm not a great sewer. Hello Becky, Have you visited that shop and seen the blanket up close? It must be lovely. I didnt care for the off-white color but thought the design was very dreamy. It looks beautiful, and I don't know how you came up with the idea of how to make it, but well done! My sewing skills are just very basic, but I do have a friend who has much better skills than I do who I think would love to try and make it.You always come up with the best ideas, and are so sweet to share them with everyone.Who wouldn't want to snuggle under that with a good book and nice cup of tea? Love this. so beautiful, and looks fluffy soft!!!! My next project when I get it fixed are clothespin and other purpose) bags for on the line....or decorating laundry room. I really like how you boldly sew without gathering or pinning! I am usually marking, basting, gathering, pinning, and then stitching. Very creative! I like to let the machine do all the work, and try to avoid too much hand labor if I can. I'm doing another blanket with a different kind of pattern of gathers. It will just be straight rows vertically, and maybe horizontally, instead of squares around squares. It will be much faster and easier. yes i have seen the blanket up close. It is very pretty and actually rather lightweight. Vertical strips sound a bit easier to me, as I'm not the greatest sewing person around, lol! The polar fleece looks really good! I can see that it is lovely and cosy as well as pretty.